Unfriendfinder was a Firefox plugin which allowed Facebook users to detect when people left their friend list or deactivated their accounts. After three years of development, Facebook requested the removal of the extension due to violation of their terms of service. The author chose not to fight the request. In response, I’ve created sumfriender, a Python script that can detect friend list changes as well as import previous friend lists from the Unfriendfinder Firefox plugin and grease monkey scripts. 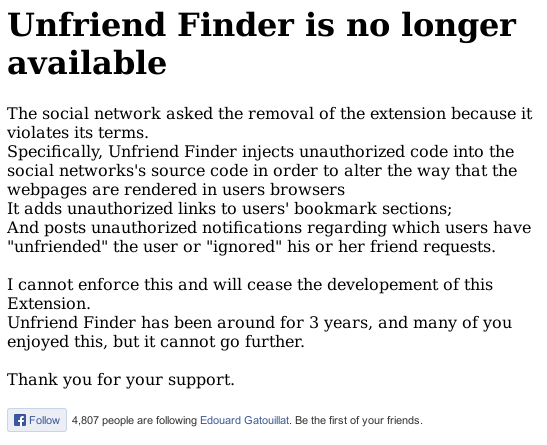 Facebook claims that Unfriendfinder violated their terms of service because it altered the interface between the user and Facebook to add in new unauthorized features. But Unfriendfinder isn’t a piece of malware. It started off as a Greasemonkey script, for which there are thousands out there designed to change the way people interact with websites that they use. It’s something users choose to install to alter the way the information they receive is presented to them or interacted with. Update: As of May 1, 2015, this script no longer works. Facebook changed their API so apps could only list friends who used the same app. They added taggable friends to their API, but my attempts to use it inplace of the current implementation have failed. The following is just for reference. Facebook recommends using https://www.facebook.com/connect/login_success.html as the redirect URL for authorization of desktop apps. Although the auth token is added to the URL, the login_success.html immediately redirects to block it out. It’s meant to be run within an embedded web browser in a desktop application where the token can be picked up programmatically before the redirect. It goes by too fast for a human to copy, so for a command line app, we need to use the fb_token.html to capture it. In the advanced section of your Facebook application settings, you’ll need to add the address to the fb_token.html file on your web server. If you had multiple people using the same web browser while logging into Facebook, you might get multiple files as shown above. The friends.txt is what will be used going forward, so select the correct one for your account and move it to friends.txt in the directory you will execute sumfriends.py from. The other files are there for your reference. sumfriends.py is the script that will grab your friends list. Upon the first run, it will open a web browser for you to authorize the application. If you’ve setup your application, redirect URL and fb_token.html correctly, you will get a token you can place in the configuration file. This token will expire very quickly, so ever subsequent time the script is run, it will exchange the token for one with a longer expiration time and save it in the configuration file. It will then show you any friends that are no longer in your list, output their details to the screen, save those details to the status.txt file and update the friends.txt file with your current friends list. "Requests a new OAUTH token with extended expiration time and saves it to the config file"
I do not distribute any application keys or secretes. You’ll have to set those up yourself. Be aware you might be violating Facebook’s terms of service by using this script. You’ll want to run this script at regular intervals using a scheduler such as cron. Since it only displays output when there are changes to your friends, you can combine it with my Ruby E-mail Script to send you e-mail notifications on changes. So you might be asking, why do I care if someone removes me as a friend on Facebook? Am I placing putting too much importance on my on-line life? Well honestly, I rarely use Facebook for anything other than Instant Message and promoting my own websites and projects. I just find it interesting what lengths Facebook would go to ensure users only experience their service in the way Facebook intended. Facebook’s primary source of income is their ad revenue. Everything they do is carefully engineered to increase your interaction time. Don’t like a new interface change? It was probably put before a focus group to make sure you dislike it enough that you spend time trying to learn how to use it, but not so much you stop interacting with it entirely. Even your feed is filtered to avoid content from friends with opinions contrary to your own, in what Eli Pariser calls The Filter Bubble. What bothers me is that Facebook would even request a take-down from Unfriendfinder. Is writing software that changes the way we interact with a website a violation of terms of service? How can it possibly infringe on intellectual property? If I built a custom web browser that added lots of additional context to the content of web pages, do the owners of those web pages have any right to demand I stop distributing my custom web browser? What does this imply about ad blocking software? What about augmented reality displays? Could a building owner sue for an advertisement a pair of glasses overlays on the building? If data is sent to your computer, whether it be audio, video or web pages, what software you chose to view and interpret that data should be up to you. With the way technology is moving, I think that in the future, we’ll see more people move off closed private networks like Facebook, Google and Twitter and to more public and open platforms. We’ll see more open source solutions, with standard publishing interfaces, that will allow more control of what people post and share and more portability for moving that data between services.